Make your communication system more flexible, time and cost-effective by using Ozeki Agent Dialer, which enables your call centre agents to call solely the available phone numbers and talk with a live person (busy, no answer and disconnected lines are excluded). This way, the agents can initiate only answered calls that increases the chances of the successful deals as well. 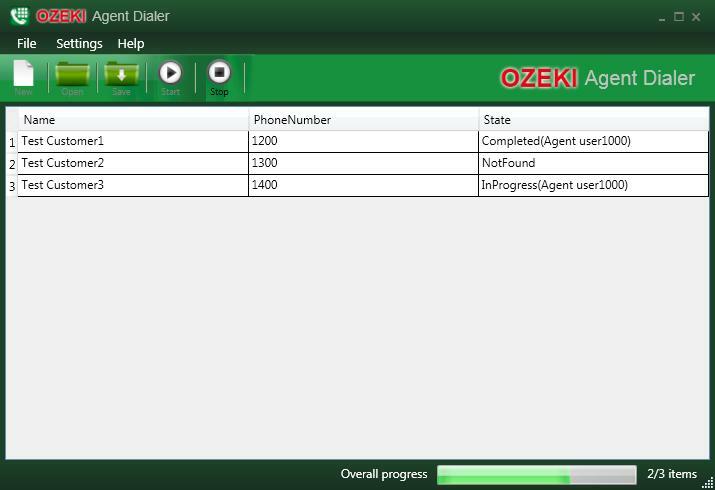 When you need to call several phone numbers from a call list, Ozeki Agent Dialer enables to dial them sequentially and automatically. If the software finds a busy, no-answer or disconnected line, the program will skip over it. The Agent Dialer switches only the available lines. It means that you will not be involved in a call until a live person answers. When a live person answers, the message status can be seen in the 'State' column. After you have finished the call, the software will dial the next available telephone number. In case of predictive dialing, the software dials an available telephone number. After the recipient answered the call, an avaliable agent connects to the call. Create a csv file filled out with user data (Name, PhoneNumber) and import your existing phone list. The call centre agents need to log in in order to be ready to answer the calls. Click on "Start" button to dial now.